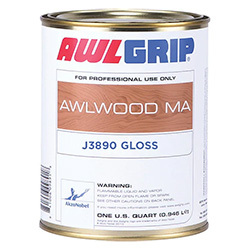 Awlgrip Awlwood MA is a two-step clear coating system consisting of a Primer and a Clear Topcoat Finish (available in either satin (matte) or gloss). The Primer must be used with this system because it bonds to the wood, while the Clear Topcoat bonds directly to the primer, it provides a natural look with outstanding multi-season performance. Awlwood's unique resin technology provides exceptional gloss and "depth", while allowing the wood color and grain to shine through. From an aesthetic point of view, this product is simply outstanding. When samples of various wood finishes are displayed side by side, the Awlwood finish is the one your eye is immediately drawn to. Aside from its outstanding appearance, Awlwood is incredibly simple to use and quick to apply. With fewer coats, faster drying (can be overcoated in as little as 1-1/2 to 4 hours!) and typically no sanding required between coats, Awlwood can achieve a stunning, better-than-varnish finish in just a few days, instead of weeks. Like varnish, the more coats, the greater the "depth" of finish. Clear Topcoat Finish must be mixed with brushing or spraying reducer (Sold Separately) depending on application process.